Stan&Walter and the Moulin Rouge combined their knowledge to make your night an unforgettable night. The first part of your event will happen on board, in the Stan&Walter bus. We’ll make you discover Paris and its gorgeous monuments. Will be including: catering, wine and champagne. Let you transport, comfortably installed in our high class bus. 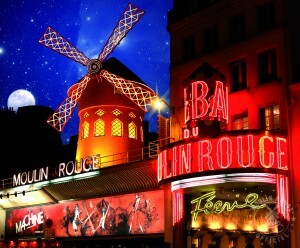 The second part of the night will make you reaching a hotspot for Parisian nightlife: Le Moulin Rouge, worldwide known for its French Cancan and its “revues”. You’ll attend the “Féerie”: feathers, pastes and glitter… 60 artists on stage, 2 hours of outstanding show. Including a glass of champagne, in a magnificient Belle Époque style auditorium. To resume: an enchanting night from A to Z.